«Mapping Hacks» by Schuyler Erle, Rich Gibson, and Jo Walsh is available from O’Reilly. «Web Mapping Illustrated» by Tyler Mitchell is available from O’Reilly. Introduces MapServer and many other related technologies including, GDAL/OGR, MapScript, PostGIS, map projections, etc. «MapServer: Open Source GIS Development» by Bill Kropla. 4: Major version number. MapServer releases a major version every two to three years. 2: Minor version number. Increments in minor version number almost always relate to additions in functionality. 5: Revision number. Revisions are bug fixes only. No new functionality is provided in revisions. From a developer’s standpoint, MapServer version numbering scheme is also like Linux. Even minor version numbers (0..2..4..6) relate to release versions, and odd minor versions (1..3..5..7) correspond to developmental versions. A: Generally, no (but see the next question). Many components of MapServer use static or global data that could potentially be modified by another thread. Under heavy load these unlikely events become inevitable, and could result in sporadic errors. Q: Is it possible to safely use any of MapServer in a multi-threaded application? A: Some of it, yes, with care. Or with Python :) Programmers must either avoid using the unsafe components of MapServer or carefully place locks around them. Python’s global interpreter lock immunizes against MapServer threading problems; since no mapscript code ever releases the GIL all mapscript functions or methods are effectively atomic. Users of mapscript and Java, .NET, mod_perl, or mod_php do not have this extra layer of protection. A: Which components are to be avoided? Q: Below are lists of unsafe and unprotected components and unsafe but locked components. Rather coarse locks are in place for the above. Only a single thread can use the global parser at a time, and only one thread can access GDAL raster data at a time. Performance is exchanged for safety. STATUS ON and STATUS OFF set the default status of the layer. If a map is requested, those layers will be ON/OFF unless otherwise specified via the layers parameter. This is particularly the case when using MapScript and MapServer’s built-in template mechanism, but is also useful as a hint when writing your own apps and setting up the initial map view. STATUS DEFAULT means that the layer is always on, even if not specified in the layers parameter. A layer’s status can be changed from DEFAULT to OFF in MapScript, but other than that, it’s always on. CGI turns everything off that is not «STATUS DEFAULT» off so all layers start from the same state (e.g. off) and must be explicitly requested to be drawn or query. That common state made (at least in my mind) implementations easier. I mean, if a layer «lakes» started ON the doing layer=lakes would turn it OFF. So I wanted to remove the ambiguity of a starting state. There are a lot of different approaches to improving the performance of your maps, aside from the obvious and expensive step of buying faster hardware. Here are links to some individual howtos for various optimizations. First and foremost is hardware. An extra GB of RAM will give your map performance increases beyond anything you’re likely to achieve by tweaking your data. With the price of RAM these days, it’s cheap and easy to speed up every map with one inexpensive upgrade. Use the scientific method. Change one thing at a time, and see what effect it had. Try disabling all layers and enabling them one at a time until you discover which layer is being problematic. Use shp2img program to time your results. This runs from the command line and draws an image of your entire map. Since it’s run from the command line, it is immune to net lag and will give more consistent measurements that your web browser. There’s confusion over what POLYLINE means in MapServer and via ESRI. In MapServer POLYLINE simply means a linear representation of POLYGON data. With ESRI polyline means multi-line. Old versions of the Shapefile techical description don’t even refer to polyline shapefiles, just line. So, ESRI polyline shapefiles are just linework and can only be drawn and labeled as LINE layers. Those shapefiles don’t have feature closure enforced as polygon shapefiles do which is why the distinction is so important. I suppose there is a better choice than POLYLINE but I don’t know what it would be. The only difference between POLYLINE and LINE layers is how they are labeled. MapScript is the scripting interface to MapServer, usually generated by SWIG (except in the case of PHP MapScript API). MapScript allows you to program with MapServer’s objects directly instead of interacting with MapServer through its CGI and Mapfile. Reverse geocoding is an activity where you take a list of street features that you already have and generate postal addresses from them. This kind of spatial functionality is provided by proprietary packages such as the ESRI suite of tools, as well as services such as those provided by GDT. MapServer is for map rendering, and it does not provide for advanced spatial operations such as this. Geocoding is an activity where you take a list of addresses and generate lat/lon points for them. This kind of spatial functionality is provided by proprietary packages such as the ESRI suite of tools, as well other sites. MapServer is for map rendering, and it does not provide for advanced spatial operations such as this. 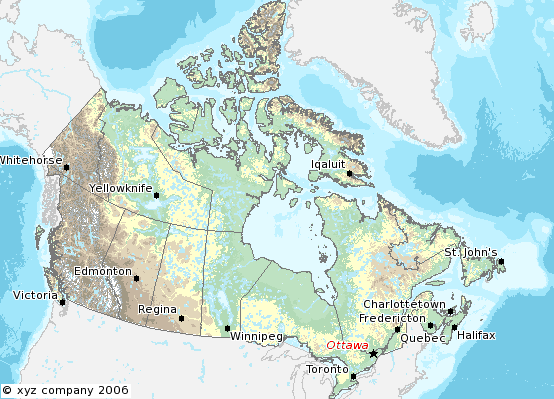 There are many free geocoders available, such as http://geolytica.com (geocoder.ca) for North America, or you can set up your own service using OpenStreetMap data, TIGER data, or other open data sources. Then you could hook your application up to use this service to provide lat/lon pairs for addresses, and then use MapServer to display those points (possibly through MapScript). In the current MapServer version, line width is set using the STYLE parameter WIDTH. For a LINE layer, lines can be made red and 3 pixels wide by using the following style in a CLASS. You must be using an old version of MapServer (where GD was the default library for rendering). Newer versions of MapServer use AGG for rendering, and the default output formats is 24 bit colour, so there should not be a problem. The default output format for MapServer with GD was 8bit pseudo-colored PNG or GIF. Inherently there will be some color degradation in converting a 24bit image (16 million colors) image into 8bit (256 colors). With GD output, MapServer used quite a simple method to do the transformation, converting pixels to the nearest color in a 175 color colorcube. This would usually result in blotchy color in a fairly smoothly varying image. Select 24bit output. This might be as easy as «IMAGETYPE JPEG» in your MAP section. Enable dithering (PROCESSING «DITHER=YES») to produce a better color appearance. Preprocess your image to 8bit before using it in MapServer with an external application like the GDAL rgb2pct.py script. For more information review the Raster Data. Although MapScript can generate the map in any desired image format it is sufficient to only consider the three most prevalent ones: JPEG, PNG, and GIF. Although GIF shows a quantitative as well as qualitative advantage over PNG when generating maps that contain full coloured remote sensing imagery, PNG is the clear quantitative winner in terms of generated file sizes for maps with or without additional monochrome imagery and should therefore be the preferred image format. If the mapping application however can also display fullcolour aerial or satellite imagery, the output file format can be changed dynamically to either GIF or even PNG24 to achieve the highest possible image quality. When I render my symbols to an 8bit output (PNG, GIF) they look fine, but in 24bit jpeg output they look very blocky and gross. You must be using an old version of MapServer . This should not be problem with newer versions. The following explains the old (GD) behaviour. In order to render some classes of symbols properly in 24bit output, such as symbols from true type fonts, it is necessary to force rendering to occur in RGBA. This can be accomplished by including the «TRANSPARENCY ALPHA» line in the layer definition. Don’t use this unnecessarily as there is a performance penalty. This problem also affects PNG24 output or any RGB output format. 8bit (PC256) or RGBA output types are already ok.
You can use an inline feature, with the FEATURE object, to make a point on your map. Use the TEXT parameter of the FEATURE object for the actual text of the notice, and a LABEL object to style the notice. How do I have a polygon that has both a fill and an outline with a width? Whenever I put both a color (fill) and an outlinecolor with a width on a polygon within a single STYLE, the outline width isn’t respected. For historical reasons, width has two meanings within the context of filling polygons and stroke widths for the outline. If a polygon is filled, then the width defines the width of the symbol inside the filled polygon. In this event, the outline width is disregarded, and it is always set to 1. To achieve the effect of both a fill and an outline width, you need to use two styles in your class. With AGG (used in recent MapServer version), antialiased lines is the default, and can’t be turned off. The bdry_counln2 shapefile referenced in the counties layer is a line shapefile. A polygon shapefile could be substituted with roughly the same results, though owing to the nature of shapefiles each border would be rendered twice and the resulting output line would likely appear to be slightly thicker. Alternatively, one could use a polygon shapefile, set TYPE to POLYGON, and use OUTLINECOLOR in place of COLOR in the STYLE element. You can tweak the combination of STYLE->WIDTH and SYMBOLSCALE to modify line widths in your output images. Cartoline symbols can be used to achieve fancier effects. See: MapServer OGC Specification support. Requesting a layer from some ArcIMS WMS connectors results in a map with misalgned data (the aspect ratio of the pixels looks wrong). Some ArcIMS sites are not set up to stretch the returned image to fit the requested envelope by default. This results in a map with data layers that overlay well in the center of the map, but not towards the edges. This can be solved by adding «reaspect=false» to the request (by tacking it on to the connection string). A beginner question here… I’m new to MS and to Apache. I’ve got MS4W up and running with the Itasca demo. Now I want to enable it as a WMS server. mapserv -v at the command line tells me it supports WMS_SERVER. When I point my browser to it, my browser just wants to download mapserv.exe! The OGC:WMS 1.1.0 and 1.1.1 specifications (which are both supported by MapServer) state that, for GetCapabilities responses, the OGC:WMS server returns a specific MIME type (i.e. application/vnd.ogc.xml (see subclause 6.5.3 of OGC:WMS 1.1.1. A MIME type is passed from the web server to the client (in your case, a web browser), from which a client can decide how to process it. Example 1: if using a web browser, if a web server returns an HTTP Header of «Content-type:image/png», then the web browser will know that this is a PNG image and display it accordingly. Basically, what is happening is that the OGC:WMS is returning, in the headers of the HTTP response, a MIME type which your web browser does not understand, which usually prompts a dialog box on whether to open or download the content (i.e. Content-type:application/vnd.ogc.wms_xml). You could configure your web browser to handle the application/vnd.ogc.wms_xml MIME type a certain way (i.e. open in Notepad, etc.). Now when I try the same test, MapServer WMS returns an XML document saying something about missing required parameters. What’s going on here? These parameters were always required in all versions of the WMS specification, but MapServer previously had not required them in a client request (even though most OGC WMS clients would issue them anyway to be consistent with the WMS spec). Which is consistent with the WMS specification. MapServer 6.0 introduces the option of hiding layers against OGC Web Service requests. OGC Web Services can provide powerful access to your geospatial data. It was decided to disable layer level request access as a default. See MS RFC 67: Enable/Disable Layers in OGC Web Services provides a full explanation of the changes and implications. This will enable access of all layers to all OGC Web Service requests. There is a text file «epsg» in your PROJ4 installation (e.g. «/usr/local/share/proj/epsg») which contain the EPSG information used by PROJ4. In Windows, MS4W users can find the epsg file at C:\ms4w\proj\nad, or it can be generally found with an environment variable called PROJ_LIB. http://spatialreference.org and http://epsg.io/ allow you to search for EPSG codes. Since my data already had a projection defined, I did not need to explicitly state a source projection. This command uses the EPSG definition for NAD83 Rhode Island (32130) and performs the feet to meters conversion. You can see how the definition in the initial command is formulated. Notice that the «+units=m» parameter has been changed to “+to_meter=0.3408”. This is important for the conversion. Where did the value of 0.3408 come from you ask? From the EPSG file! It has many goodies buried in it so by simply running „grep «to_meter» epsg’ you can refresh your memory if you need to. The next parameter in the command is «-t_srs EPSG:32130». This command tells ogr2ogr to transform the data to the EPSG code of 32130. After this is declared, all you need to do is declare a file name for your new shape file and to set which file is being used as the input (note: make sure you don’t confuse the order of these two). Hit enter, bombs away, and enjoy your new data in meters! New documentation material and corrections to existing documentation are definitely very welcome. These contributions are handled through the same issue tracker used to track software bugs and enhancements. Follow the directions for submitting bugs at: http://www.mapserver.org/development/bugs.html. When creating a ticket, in the Component field, select MapServer Documentation . If our ticket pertains to a specific web page, please include the URL to that page. The MapServer logo illustrates the confluence of the Minnesota and Mississippi rivers, quite near to the home of the St. Paul Campus of the University of Minnesota, which was the birthplace of MapServer. Where is the MapServer log file? What books are available about MapServer? How do I compile MapServer for Windows? What do MapServer version numbers mean? What does STATUS mean in a LAYER? How can I make my maps run faster? What does Polyline mean in MapServer? Does MapServer support reverse geocoding? How do I set line width in my maps? Why do my JPEG input images look different via MapServer? Which image format should I use? Why doesn’t PIL (Python Imaging Library) open my PNGs? Why do my symbols look poor in JPEG output? How do I add a copyright notice on the corner of my map? How do I have a polygon that has both a fill and an outline with a width? How can I create simple antialiased line features? Which OGC Specifications does MapServer support? Why does my requested WMS layer not align correctly? When I do a GetCapabilities, why does my browser want to download mapserv.exe/mapserv? Why do my WMS GetMap requests return exception using MapServer 5.0? Using MapServer 6.0, why don’t my layers show up in GetCapabilities responses or are not found anymore? Where do I find my EPSG code? How can I reproject my data using ogr2ogr? How can I help improve the documentation on this site?